BBC News - Should it be Burma or Myanmar? Should it be Burma or Myanmar? 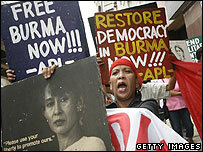 Protest marches in Burma have entered a ninth day. But why is the country not known in the UK by its official name, Myanmar? The eyes of the world's media are focused on Rangoon, where tensions are rising in the streets, yet news organisations and nations differ in what they call the country. The ruling military junta changed its name from Burma to Myanmar in 1989, a year after thousands were killed in the suppression of a popular uprising. Rangoon also became Yangon. The Adaptation of Expression Law also introduced English language names for other towns, some of which were not ethnically Burmese. The change was recognised by the United Nations, and by countries such as France and Japan, but not by the United States and the UK. A statement by the Foreign Office says: "Burma's democracy movement prefers the form 'Burma' because they do not accept the legitimacy of the unelected military regime to change the official name of the country. Internationally, both names are recognised." It's general practice at the BBC to refer to the country as Burma, and the BBC News website says this is because most of its audience is familiar with that name rather than Myanmar. The same goes for Rangoon, people in general are more familiar with this name than Yangon. But look in a Lonely Planet guidebook to Asia and the country can be found listed after Mongolia, not Brunei. The Rough Guide does not cover Burma at all, because the pro-democracy movement has called for a tourism boycott. So does the choice of Burma or Myanmar indicate a particular political position? Mark Farmener, of Burma Campaign UK, says: "Often you can tell where someone's sympathies lie if they use Burma or Myanmar. Myanmar is a kind of indicator of countries that are soft on the regime. "But really it's not important. Who cares what people call the country? It's the human rights abuses that matter. "There's not a really strong call from the democracy movement saying you should not call it Myanmar, they just challenge the legitimacy of the regime. It's probable it will carry on being called Myanmar after the regime is gone." The two words mean the same thing and one is derived from the other. Burmah, as it was spelt in the 19th Century, is a local corruption of the word Myanmar. They have both been used within Burma for a long time, says anthropologist Gustaaf Houtman, who has written extensively about Burmese politics. "There's a formal term which is Myanmar and the informal, everyday term which is Burma. Myanmar is the literary form, which is ceremonial and official and reeks of government. [The name change] is a form of censorship." If Burmese people are writing for publication, they use 'Myanmar', but speaking they use 'Burma', he says. This reflects the regime's attempt to impose the notion that literary language is master, Mr Houtman says, but there is definitely a political background to it. Richard Coates, a linguist at the University of Western England, says adopting the traditional, formal name is an attempt by the junta to break from the colonial past. "Local opposition groups do not accept that, and presumably prefer to use the 'old' colloquial name, at least until they have a government with popular legitimacy. Governments that agree with this stance still call the country Burma. "The UN uses Myanmar, presumably deferring to the idea that its members can call themselves what they wish, provided the decision is recorded in UN proceedings. There are hosts of papers detailing such changes. I think the EU uses Burma/Myanmar." Other countries to rename themselves like this include Iran (formerly Persia), Burkina Faso (Upper Volta) and Cambodia (Kampuchea). "They've substituted a local name for an internationally acknowledged one for essentially nationalistic and historical reasons."